Born Green Bay, Wisconsin, December 18, 1947; married; 3 children, 11 grandchildren. Graduate Green Bay West High School; B.S. University of Wisconsin-Green Bay, 1971. Full-time legislator. Former teacher. Former truck driver for Green Bay Department of Public Works. Former Teamster’s Union steward. Former member: Brown County Human Services Board (chair); N.E.W. Zoo Advisory Board; Brown County Education and Recreation Committee (chair); Great Lakes Compact Commission. 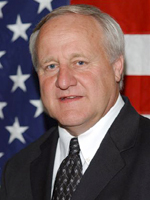 Brown County Board supervisor, 1996–2002. Elected to Senate since 2000. Leadership positions: Assistant Minority Leader 2015, 2013, 2011, 2005, 2003; Majority Leader 2009 (effective 12/15/10); Assistant Majority Leader 2011 (effective 7/24/12), 2009, 2007.